With warmer weather on the horizon, it’s time to pack away our heavy-duty winter gear and transition to lighter layers. The seasonal wardrobe change is always a great opportunity to examine our closets. We accumulate so much stuff over the years and our closets suffer because of it. Our quality of life suffers because of it. And yeah, that’s a completely dramatic statement to make, but wouldn’t life be a little better if your closets were organized and only contained things you use? The spring purge is a daunting task, yet necessary for keeping a balanced home. We use our closets, dressers, and armoires multiple times a day, and that makes them a priority. If your closet is a source of stress and frustration, you have complete control to change things. You can rid that closet of junk you haven’t touched in years. The doors can close with ease, garments don’t have to be shoved onto the hanger, and each time you visit your closet, you can feel relaxed knowing everything inside is functional. This may sound like a huge undertaking, which is why we’re doing this together. We’re going to see what’s been out of the rotation, what doesn’t fit anymore, what items you bought and couldn’t make an outfit with, and the sentimental pieces like items you spent a pretty penny on, and those special pieces we keep just in case. With this closet cleanse cheat- sheet, you’ll easily be able to identify the items worth keeping and the ones that could go on to the donate pile. If you LOVE this piece (and really love it, because why keep it if it’s a “meh”) then ask yourself: Is it something you could get tailored? Could the buttons be switched out for an updated look? Does it match three other pieces for a complete look? If your answers are “yes,” then pull the pieces aside for alterations or keep pile. For pieces you’ve spent more than $200 on, and are in new or lightly used shape, consider taking them to your local consignment shop. Designer items like a classic Chanel suit or a St. John knit will always be bought through eBay or consignment, but if it’s something that’s truly significant, it can stay as long as we remove something else. washes and wear), and has it discolored or faded? If yes, you know what to do (donate pile!) What does the texture of the fabric look like — is there any pilling or are there snags? Some of these things can be remedied with fabric shavers, but sometimes it’s best to donate and move on; if the piece is in rough shape and not suitable for donation, tossing it out is also an option. Trends are always changing season to season, and most of us are guilty of buying these trend items that now look dated and done with. These are donate items. Your closet should be a cohesive collection of all things that reflect your personal style. Do these garments represent the image you want to portray? Do they all live in the same style-lane? Get rid of anything that feels random or out of place. If it feels random and you still love it (again, truly love), are you willing to buy three pieces that match, in order to create an outfit option? If not, then donate! There’s no need to hold on to anything if it can’t be paired with multiple looks in your wardrobe, and you’re not willing to purchase pieces to make it work. considering they can be stored easily and are literally sold everywhere. Keep it simple; donate the styles you haven’t touched since you bought them for that trip 4 years ago. Pitch the ones that have seen better days and are barely hanging on. When it comes to loafers and heels, address their condition: How are the soles? If they were high-quality, are you willing to get them re-soled for a fresh life? Are they creased and discolored? Have the heels worn down or been chewed on? Most shoes can be given a second chance with the magic of a great shoe repair shop, but only invest in this if the shoe is made of natural materials. For designer shoes that may be out of style, take them to your consignment shop. Same guidelines go for handbags — if you haven’t carried it in a few years, it may be time for it to move on to a new home. I’m someone who rotates bags season to season, so I may skip a winter with a certain bag. That’s completely fine. But for the bags you bought years ago that just sit there, add them to the donate pile. This goes for crumpled tote bags, beach bags, old evening bags, and any other bag that has seen better days. For designer bags, consider luxury resale sites like Rebagg or Poshmark. 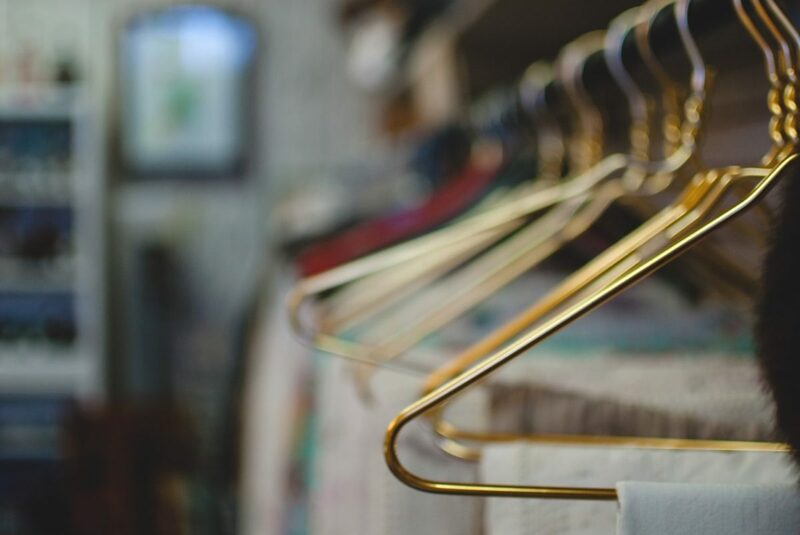 Our closets become the catch-all to random accessories and clothes we collect throughout the years; some are good purchases and others are just a total waste of space. Take the time this spring to go through at least one closet and lighten up your load! Start this season with a closet re-fresh and I guarantee you’ll want to do it every season!